Having moved to London in 1968, Davey got his first album credit that year on the Noel Murphy LP, Another Round. Noel and Davey then formed the band Draught Porridge in 1969. In 1970 Davey played on the album Seasons by Magna Carta and in 1971 joined that group as second guitarist. Their next album, Songs From Wasties Orchard (named after the street Davey lived on), was helmed by Elton’s producer, Gus Dudgeon. Gus asked Davey to contribute to Bernie Taupin’s solo album in 1971. Davey played guitar, sitar, banjo, mandolin and lute while Bernie read his poetry aloud. Soon after, in August 1971, Gus called upon Davey once more, this time to play acoustic guitar and mandolin parts on four songs on Elton’s Madman Across The Water album, including the intricate harmonic part that anchors the title track. A week or so later, Elton invited Davey to join the band full-time, joining drummer Nigel Olsson and bassist Dee Murray both in the studio and on stage — and thus was born the group that solidified Elton’s sound. Davey on stage in 1974. 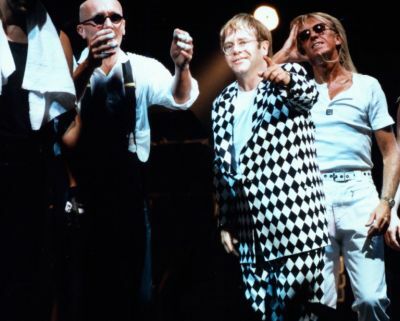 Davey, Nigel and Dee reunited with Elton in 1982 for a world tour and the recording of Too Low For Zero and Davey has remained with Elton ever since. Davey toured extensively with Elton until 1986, including an appearance at Live Aid, when the singer had to have surgery on his vocal cords at the conclusion of the Australian tour with the Melbourne Symphony Orchestra. During the next two years Davey would resume his session work in Los Angeles.